“Puffs” or pan fried bread is my grandmother’s specialty… a simple fry bread with yeast that she would make the night before to have for breakfast the next day. Her easy fried dough recipe is legendary in our family and best served with a pat of butter and your favorite jam. It’s not an exaggeration to say that every time we visited Myne and Grandad (my Dad’s parents) up in White Stone, Virginia, my grandmother would make her famous “Puffs” for breakfast. Essentially a fry bread with yeast (instead of baking powder) it’s the kind of recipe that family traditions are made from. Myne’s easy fried dough recipe was always “made up” the night before, so the Puffs could rise and be ready to fry for breakfast. The next morning — without fail — my grandmother would remove the towel from the bowl of dough and with an alarmed look, pronounce that “the puffs didn’t rise.” Panicked at the prospect of no Puffs for breakfast, we would rush to the kitchen — only to find that Myne was making it up – the dough had risen. Her prank was repeatedly (and flawlessly) executed every time she made a batch. Add the shortening and break it apart with your fingers. Stir in the sugar and salt, swishing and stirring until dissolved. Add the flour a little at a time, stirring and kneading until the dough is smooth and elastic. Form it into a ball, then place the dough in a lightly greased bowl and cover with a clean towel to rise at least two hours or overnight. You can see from the photo that the dough “puffs” and spreads in the bowl. To make the fried dough, fill a heavy cast iron skillet with deep sides or dutch oven with about 2″ of vegetable oil or Crisco. I know, it’s not the healthiest ingredient, but come on it’s fried bread. You didn’t think it would be good for you. I make no apologies – Crisco was big back in the day and in this recipe it makes crisp light puffs..
Heat over medium high heat until the temperature is about 350°-375°. Make a “tester” with a small pinch of dough. Stretch it out and carefully place it in the hot oil. If the oil bubbles lightly around the dough, it needs to heat more. If it starts to bubble furiously, it’s hot enough. Pull off a golf ball sized piece of dough, flatten it and pull the sides until the dough is about 1/4 to 1/3″ thick and 3″ in diameter (Note: it will never be a perfect circle, so don’t even try) . Gently place the dough in the hot oil – releasing it away from you to avoid splatters and burns. Cook for a few minutes until the underside is golden and brown. Use tongs or a long-handled fork to gently turn the pan fried bread and fry for an additional minute or so until crispy and golden. Transfer to a paper towel lined baking sheet. Keep warm in a hot oven while you make the rest — or serve them as soon as they come out of the fryer (the best way). We like them with a pat of butter and homemade jam. Incidentally, my Mom made this batch of pan fried bread in my grandmother, Myne’s kitchen in Virginia last week. That’s her cast iron pan, above. The photos below show the plate of puffs as we normally serve them… hot from the fryer. The jam on the left is Mom’s homemade guava jam and the one on the right is my Aunt Lynne’s apricot jam… recipe to come. What Do Puffs Taste Like? Speaking of Myne, I visited her with my parents just last week. During our visit, she invited me to go through her kitchen and see if there was anything I could use for the blog. We found her old recipe box filled with hand written favorites on index cards. Some recipes credited relatives and neighbors (i.e. Aunt Betty’s recipe…) and there was more than one rendition of jelled salad (jell-o molds) in her files. When we found the puffs recipe, I knew we had to make them. Create your own special memories and make Myne’s Puffs for your family. 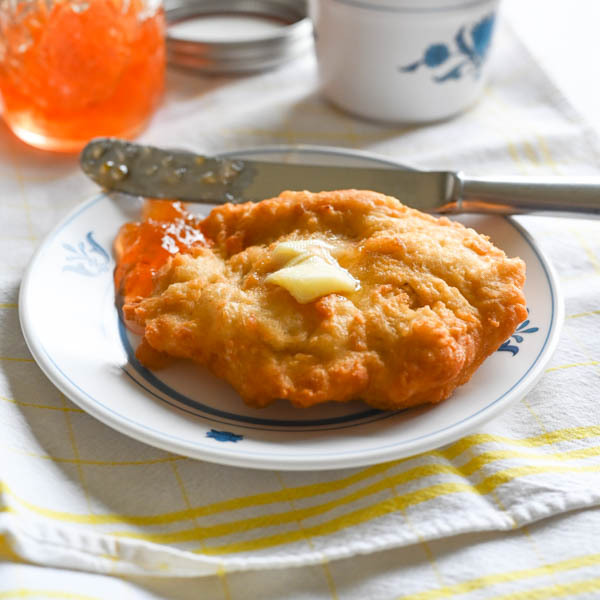 A family favorite for weekend breakfasts, this fry bread is great with a melty pat of butter and your favorite strawberry jam. Any leftover dough can be formed into rolls for an evening meal. 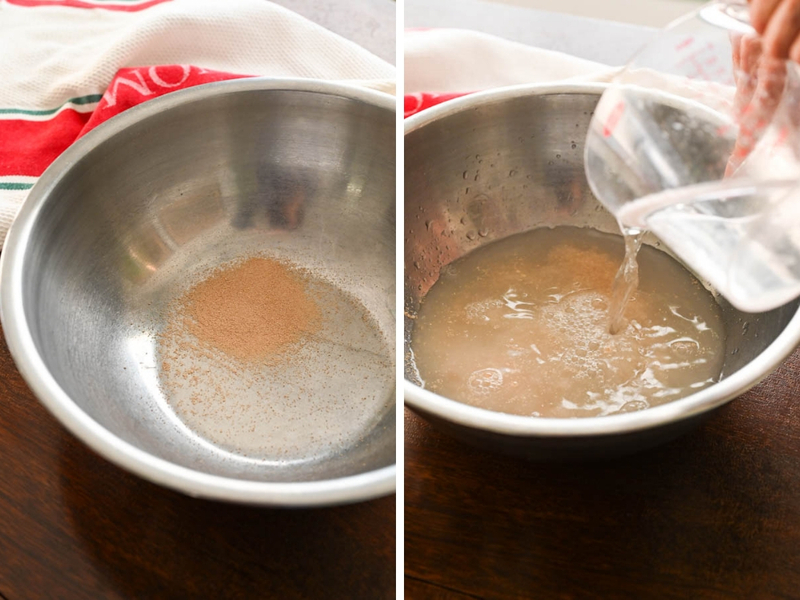 Add the yeast to a large bowl and stir in the water. Let the yeast dissolve and bloom for a few minutes. Add the shortening and swish and break it apart in the water with your fingers. Stir in the sugar and salt until dissolved. 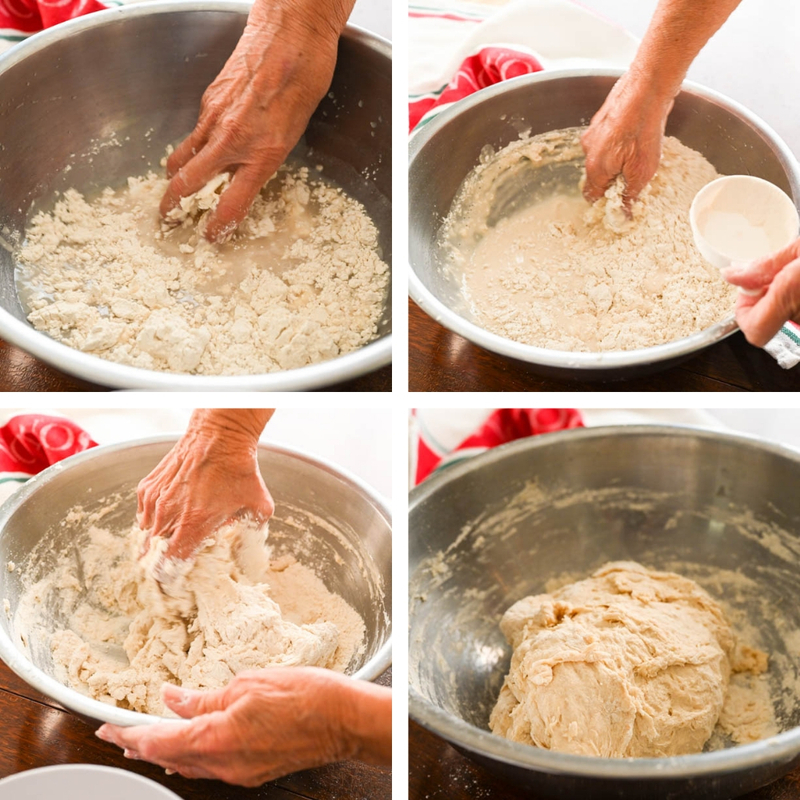 Add flour a little at a time, kneading with your hands until the dough is smooth and elastic. Form the dough into a ball. Lightly grease or oil a large bowl with vegetable shortening and place the dough in the bowl. Flip the dough once or twice so it gets a light coating of grease (this prevents it from forming a "skin". Cover the dough with a clean dish towel and place in a draft free area to rise. (I usually stick it in a cold oven). 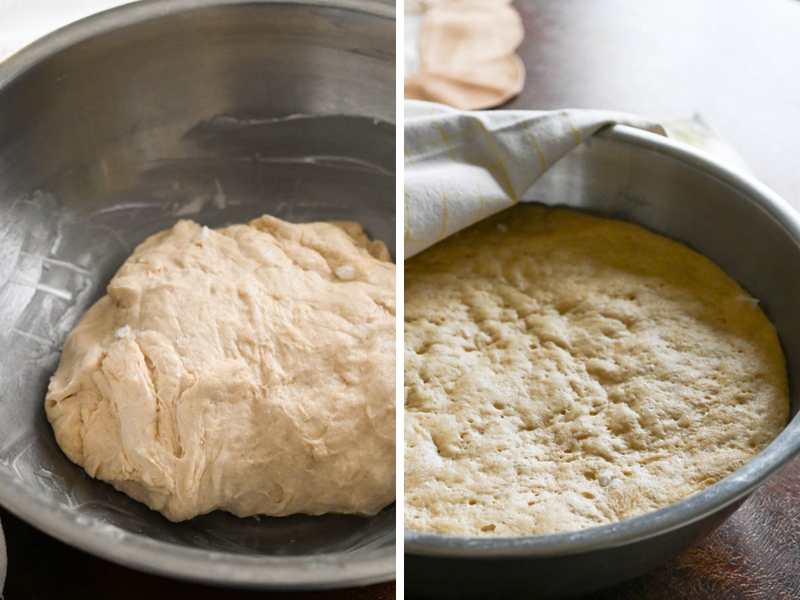 Let the dough rise for 2 hours or overnight. Place a wide, deep cast iron skillet or dutch oven over medium high heat and add about 2 inches of vegetable oil or Crisco. Heat the oil to about 350°-375°. Pinch off a dime-sized piece of dough and stretch it, so that it's very thin (about 1/4"). Carefully place the dough into the hot grease. This is your tester-- and it will determine if your oil is hot enough. If the oil rapidly bubbles around the dough it should be the right temperature. Cook the tester for about 1-2 minutes until golden on the bottom, then flip it and cook an additional minute. The bread should be crisp and golden. You can eat this piece to determine if the oil should be hotter or if it's just right. To make the puffs: Line a sheet pan with several layers of paper towels and set near the pan of oil. Pinch off a golf ball sized piece of dough and flatten it to a disc in your hands. Hold the edges of the dough and work it in a circle to stretch and enlarge the circle until it's about 3" to 4" in diameter. Carefully place the puffs into the oil (away from you to prevent splashes and burns). Fry for 1 to 2 minutes until golden, flip over and continue to cook for another minute or so until the puffs are crispy and golden. Depending on the size of your pan, you can make 3-4 at a time. Transfer the fried puffs to the paper towel lined sheet pan and continue to fry the puffs in batches and keep them warm in a low oven until you're ready to serve -- or if you're like my family... just keep making them as they're being snatched off the tray. You can also keep them in a warm oven and serve all at once, but they're really best served immediately. Pin “Grandmother’s Puffs – A Southern Fry Bread with Yeast” For Later! You are so so lucky to still have your grandmother! This was lovely to read. She sounds like a real prankster 😉 My kind of grandma! These puffs are off the chain. So crisp yet fluffy and anything more than a bit of butter and jam would do them an injustice! Some things are so great, they’re best enjoyed in their simplest forms. Thanks for sharing these memories! The fry bread is awesome and to be fair — that guava jam is amazing too. Recipe available on this site. What a beautiful memory! My grandma used to make something similar, but being Irish it contained potatoes 🙂 We use to devour them every time she made a batch. Love that you are still memories in the kitchen with your own mom! I love this post! Food is so much more than food! It’s traditions and memories and you really brought that out in this post. By the way, I think hands are totally underrated as a kitchen tool. You get so much information when you work with your hands–texture, temperature, moistness. You just can’t get that with a spoon. Yum! My kids always love the fried dough at carnivals….I have never even considered making it at home. You make it look so easy and good. I am going to surprise them and do this! Thanks. I’m so happy that you’re keeping this wonderful traditional recipe going – and even happier that you’re sharing it with us! It’s totally my kind of recipe too. I love a nice, simple, carb-tastic bread that’s distinctive on its own yet plain enough to work with whatever sweet side you serve it with. I looooove how airy and crispy these look. And hey, I’ll have to remember that whole ‘they didn’t rise!’ trick when I need to mess with MY future grandkids. Hahaha. 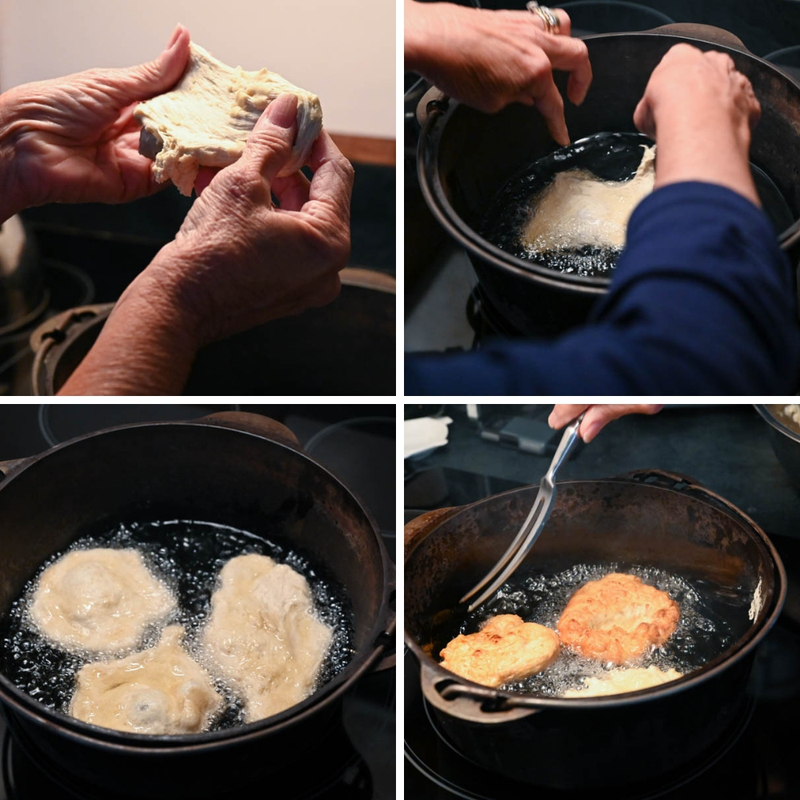 Southern Grandma’s knew a thing or two about bread and frying. Not only that but they made it taste soooo good. !! These puffs would certainly go well with Southern Fried Chicken or even some nice pan-fried pork. Yum!! Thinking about the menu is making me hungry! I’m planning on a Southern style menu tomorrow – these puffs are a must to go along with everything. Oh my goodness! These look amazing! I remember having these one time when I was a child and have never had it since. I totally forgot about it but now I remember how good it was. I’m going to need a batch of these for old times’ sake! Also, if you need a mold for those jello salads that you found, I’m your girl… I surprisingly had one gifted to me haha. 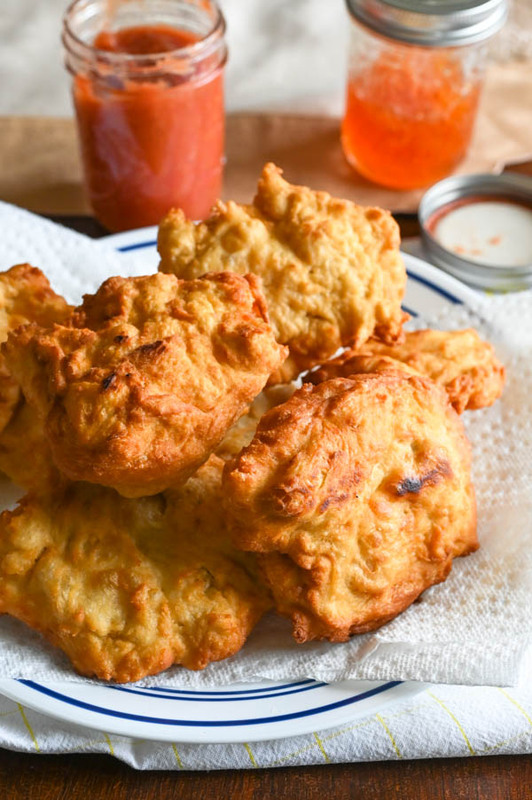 I love making recipes that have been passed down from generation to generation like this southern fried bread because you know that they are tried and true. And your grandma’s handwritten recipe cards made me miss my grandma; she’s the one that taught me how to cook, and i still have the fondest memories of her kitchen. Love the recipe and the story behind it! Ahhh Hiiiii Grandma Myne!! You’re the sweetest and a genius with this recipe! This with your mom’s guava jam – love the history. I can’t wait for the apricot jam, next! Well those Gramma’s know a thing or two when it comes to cooking. I sure miss the wonderful food my baba made in her kitchen. Isn’t it funny, they didn’t have all the fancy gadgets we have today, yet their food was ALWAYS so delicious. Love the sound of this recipe. The bread lover in me would devour this for sure. I agree, the grandma’s rule! I think we should all take a few tips from them! I was looking at your blog and was astounded to see that you had reincarnated the recipe of your grandmother’s Sunday morning puffs. I was overcome with a little bit of history from my past which I want to share. Several years before your mom and dad met, I had the occasion to experience in this breakfast delight while visiting your Uncle Chip, who was my best high school buddy at the time. We’re talking 1965 era. In those days, I called Myne Mrs. Hudson, as she was the highly respected mother of my good friend. In any case, I have never forgotten that event. The puffs were fantastic, and I indulged in more than a few. Anxious to try these again. Thanks for sharing that bit of history. Uncle Frank, I didn’t know that story, thank you so much for sharing your memories with me. If you want to experience those puffs again, I’m happy to make them for you — and for that matter, I’m sure Mom would be too. Sounds like a plan for the next family gathering! This looks very similar to the fried bread my grandmother & mother made when I was growing up. We are them with fried eggs or spread them with butter, then dipped in sugar. I’m hearing from a lot of people who have eaten this their whole life — all with a different way of eating it! So cool to know that we’re all connected. I’ve decided that there’s not nearly enough fry bread where I live (the Northeast), I think I’ll have to pass this recipe around! LOL! That’s too funny — feel free to share the love! There are so many things I love about these puffs! First off, they look scrumptious! Second, I love that your grandmother used her hands throughout the whole mixing. I do that myself! 🙂 I need to try these asap. Grandmothers recipe are always special and this one looks so good. Have to try it out for the family. Thanks for sharing this traditional recipe. What a great traditional recipe, and I love the prank your grandmother played! It reminds me of cooking with my grandfather – he always made it fun. Must give these a try soon! I’ve never made something like this before! 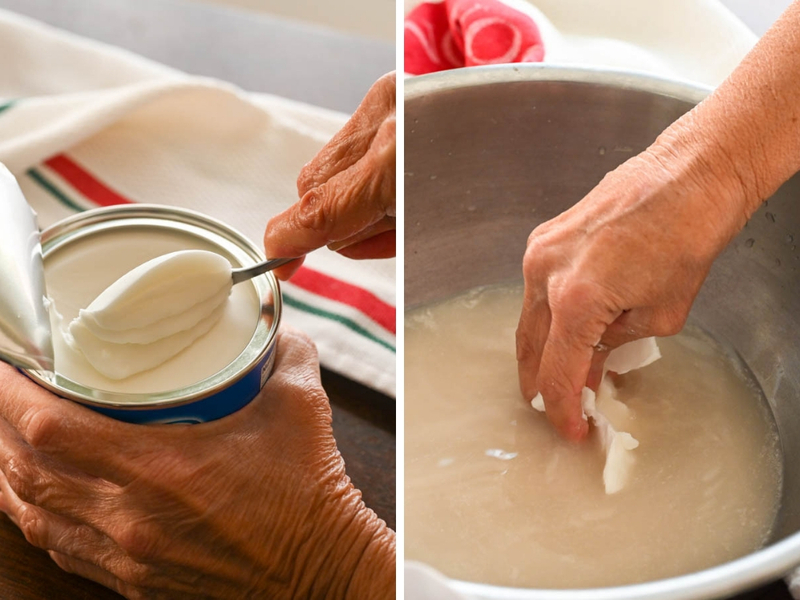 How sweet that you are able to make your grandmother’s recipes! I love the back ground to these puffs! Love hearing family stories to food traditions. My grandma used to make fry bread all the time, I can’t wait to try your grandmother’s! Did you call it fry bread or did it go by another name? Just remember that the tester puff is reserved for you father! These look great! What a wonderful treasure to have her old recipes. Absolutely, Katrina! And you need to try these puffs.